Fantastic Beasts and Where to Find Them apparates in movie theaters already threatening to be the first of five films. Packing the most threadbare of story and characters in Newt Scamander (Eddie Redmayne)'s magical suitcase, Fantastic Beasts has nothing on its mind besides slamming the helpless audience with two hours of non-stop CGI pandemonium masquerading as "magical adventure" while picking their pockets with sleight of hand. There is no whimsy or wonder in Fantastic Beasts' color-bled version of 1920's New York City, nothing resembling human emotion or interest, certainly nothing truly magical. Fantastic Beasts' idea of ending every scene is having the CGI animals destroy every set, and its idea of a happy ending is having the Wizards use their wands to magically repair the sets. Written by Harry Potter creator J.K. Rowling and helmed by the franchise's sitting bull director David Yates, Fantastic Beasts is the most soulless, somnambular, and egregious example of franchise masturbation in movie theaters today. Plenty of noisy sturm und drang occurs in Fantastic Beasts. A British Wizard named Newt Scamander arrives in New York City hoisting a suitcase containing magical beasts which are contraband in the magic-ignorant United States. Some of the beasts get loose and Scamander, with the aid of former Auror Tina Goldstein (Katherine Waterston) and down-on-his-luck human Jacob Kowalski (Dan Fogler), scuttle about Manhattan trying to recapture the ridiculously destructive creatures. There's also some hubub of a pre-Voldemort Wizard criminal escaped from England and hiding in New York, visits to the immensely pedantic Magical Congress of the United States, and Colin Farrell as an obviously evil Wizard working for the Magic Congress holding in his thrall the simpering, weirdo son (Ezra Miller) of a woman warning against the infestation of witches in America. This all culminates with all of the Wizards, good and evil, chasing after the ever-imaginative staple of lazy blockbuster films: a CGI black cloud of ash destroying the city. This after over 90 minutes of watching some of the unsightliest CGI monsters ever rendered destroying locations like the Central Park Zoo. The Harry Potter franchise has honestly always had an ugly CGI problem, but Fantastic Beasts ups the ante; Fantastic Beasts has more unpleasant and frenetic CGI than all 8 prior Harry Potter movies put together. As the hero of Fantastic Beasts, Newt Scamander is an utter failure. Lacking a raison d'etre besides something about traveling to Arizona or a backstory even a fraction as interesting as Neville Longbottom's, much less Harry Potter himself, Redmayne plays Scamander as an incomprehensible cypher. Redmayne, whose dialogue desperately needed to be subtitled, affects a bizarre accent making him nigh-impossible to understand, especially when he's simply telling the audience the names of his CGI creatures. Redmayne isn't even as competent a zookeeper as Tracy Morgan's Brian Fellows from Saturday Night Live. Waterston as a "good" Auror and Farrell as an "evil" Auror, are dual sides of the same, boring coin. The only character reasonably sympathetic is Fogler, who simply wants to open a bakery and get with Waterston's floozy sister, making him by default the most relatable person in Fantastic Beasts. (Fogler cackling every time he takes a sip of Wizard booze is the only fleeting dose of humor in this dour, interminable slog.) Fan service name checks of Albus Dumbledore, Hogwarts, the LeStrange family, and Farrell's Deathly Hallows logo keychain (available for purchase where ever Harry Potter merchandise is sold!) remind that Fantastic Beasts exists purely as an obnoxiously transparent attempt to extend the money-making capacity of the Harry Potter franchise. But the Wizarding World of Newt Scamander is a real snoozefest, unless you're looking for a Fantastic Nap and Where to Find It. A tale of first contact with otherworldly aliens like no other, Denis Villeneuve's Arrival couldn't arrive in theaters at a more opportune time. Deliberate, dream-like, and arresting, Arrival's heady themes address xenophobia, trust, loss, memory, and international cooperation laboring against militarized fear and ignorance to achieve an understanding with creatures as different from human beings as you can imagine. When twelve 1,500 foot tall space craft (dubbed "Eggs") suddenly materialize over twelve random locations around the world, brilliant linguist Amy Adams is recruited by US military liaison Forest Whitaker make contact with the aliens in the Egg hovering over rural Montana. Adams is joined by theoretical physicist Jeremy Renner; together they are charged with the daunting task of deciphering the language of the aliens, dubbed Heptapods. As far as human-alien negotiations go, Arrival is the polar opposite of when Adams met the handsome farm boy from Krypton in Man of Steel. The Heptapods are thoroughly inhuman. They're like enormous Dr. Zoidbergs from Futurama; octopus-like creatures without visible eyes, which communicate by making circular symbols with octopus ink, like an otherworldly Etch-a-Sketch. But why are they here? What are the Heptapods trying to tell humanity? Adams is haunted by memories of her daughter, whom she lost to cancer. But are they memories at all, or something more? Arrival carefully reveals the answers, while lobbing the intriguing notion that by learning another language, one can literally re-wire their mind to achieve a different, heightened form of perception. Meanwhile, the clock is ticking as the unprecedented collaboration between the other nations also communicating with the Heptapods collapses as China, gripped with fear, declares war on the alien ships, causing other governments to follow suit. It's up to Adams to find a way to literally prevent a war of the worlds, building to Arrival's astounding conclusion. Arrival is a sci-fi ray of hope, of patience and intelligence outweighing fear and ignorance, ideas and truths to ponder and positively act upon during these darkening days of our own time. Doctor Strange sees the Marvel Studios machine working at full-bore, essaying its magical Sorcerer Supreme into movie theaters while busily checking off a Greatest Hits list of Things That Worked Before in Other Marvel Movies. As a Marvel origin story, Doctor Strange borrows wholesale from the previous magic of Iron Man and Thor. We're introduced to Dr. Stephen Strange (Benedict Cumberbatch, cheerily belaboring an American accent), world famous, mega-successful neurosurgeon. Like Tony Stark and Thor, Strange is at the top of his field, which is perhaps all the more remarkable with that surname. Wealthy people felt confident putting themselves in the hands of a surgeon named "Dr. Strange?" In the Marvel Universe, apparently so. Also like Tony Stark and Thor, before assuming the mantle of a hero, Strange is an arrogant snotball who needs to be taken down a peg. Strange does this to himself when he races his Lamborghini in the rain without paying attention to the road and drives himself off a cliff. He survives, but suffers permanent nerve damage to his hands, ending his surgical career. When neither begging lesser surgeons to treat him nor emotionally abusing his colleague and ex-lover Dr. Rachel McAdams cures his hands, Strange absconds to Nepal looking for a miracle. In the magical compound of Kamar-Taj, Strange finds his salvation in the form of the Ancient One (Tilda Swinton), a magical Mr. Miyagi who shows Strange the secret of Marvel sorcery. Initially scoffing at the idea of magic and the multiverse, Strange nonetheless begins his mystical training at Kamar-Taj, rapidly gaining enough power to be able to stop Kaecillius (Mads Mikkelsen), who sports perhaps the least memorable and Kae-silliest of Marvel movie villain names. Kaecillius was the Ancient One's protege but turned to a new master, Dormammu, the nefarious lord of the Dark Dimension. Dormammu wants to swallow the entire universe and especially wants Earth because Earth rocks. Lots of great stuff on Earth, like Infinity Stones, one of which turns out to be Doctor Strange's magical amulet the Eye of Agamotto. Doctor Strange also receives a magical Cloak of Levitation, which chose him for some reason and stopped just short of sorting him into Gryffindor. In Doctor Strange, Marvel Studios gets to do their version of Inception, with New York City bending its skyscrapers into itself in multiple dimensions as Doctor Strange and Mordo are chased by Kaecillus and his band of no-dialogue magical henchmen. Christopher Nolan now knows how the Wachowskis felt when everyone started stealing bullet-time after The Matrix. Cumberbatch is a game Doctor (don't call him Mister or Mister Doctor) Strange. He is never more interesting than when he first arrives at Kamar-Taj, a broken but still arrogant man, and the Ancient One literally yanks his astral form out of his body. Yet Doctor Strange's magical abilities come too quickly (the Ancient One even matter-of-factly points this out and then moves along) and with no cost. Doctor Strange doesn't for a moment dwell on the price one traditionally must pay for using magic. In Doctor Strange's universe, Strange just grows more and more powerful and acquires more and more stuff, like a Greenwich Village Sanctum to hang his cloak in. Together with Wong (Benedict Wong), the wry librarian of Kamar-Taj, and Mordo (Chiwetel Ejiofor), the Ancient One's loyal, intractable pupil, Strange battles Kaecillius in London, New York, and Hong Kong, before facing off with Dormammu in the Dark Dimension and pulling a magic trick on him right out of Groundhog Day and Edge of Tomorrow. As Doctor Strange's villains, Mikkelsen doesn't break from the established Marvel movie tradition of underwhelming antagonists. Mikkelsen merely does a riff on Le Chiffre, the Bond villain he played in Casino Royale a decade ago, right down to having messed up eyes. Mikkelsen even cries a tear (but not of blood) when he explains what his beloved Dormammu is to Strange. Dormammu is quite a disappointment, just a talking face in outer space. Dormammu is sadly nothing more than a version of the reviled evil space cloud Parallax Green Lantern fought in his space dud of a movie, with just a smidge more personality. Mordo even turns evil at the end, like Sinestro arbitrarily did at the conclusion of Green Lantern. The Ancient One sends Doctor Strange on a magical journey across the multiversal dimensions, but Ant-Man went through a similar trip just two summers ago when he kept shrinking into infinity. To hammer home Doctor Strange's Marvel pedigree, a certain God of Thunder drops by in the expected end credits Easter egg to commiserate; both missed out on this year's wildly successful Captain America: Civil War and eagerly position their parts in the upcoming Avengers: Infinity War. More power to them. 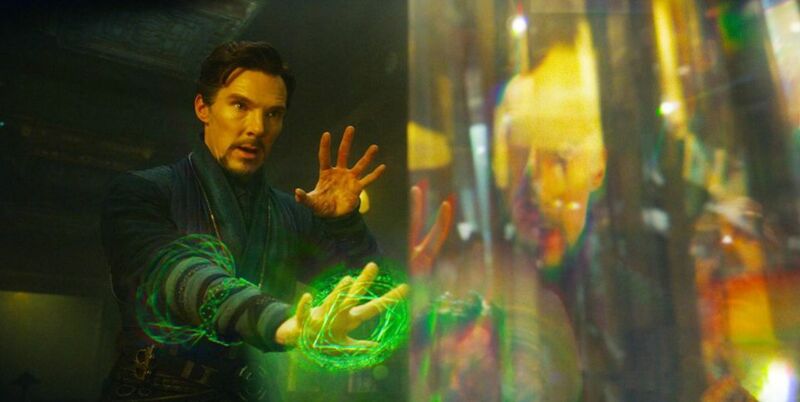 Doctor Strange is Marvel Studios casting their movie magic strictly by the book.